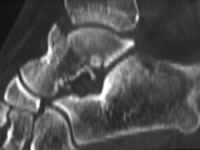 Inokuchi defined a fracture of the talar body as one in which the main fracture line exited the inferior cortex of the talus into the posterior subtalar facet. Nevertheless, some fractures have both neck and body components. Fractures of the body are about half as common as fractures of the neck. These are almost all high-energy energy injuries, with 20% of open injuries. Patients often have polytrauma with other limb injuries. There is damage to both ankle and subtalar joints in most cases, and fragments may become detached from their blood supply and develop osteonecrosis. The majority are shearing fractures with two major components; the main fracture line is coronal or sagittal in approximately equal numbers. About 20% of fractures are comminuted. The patient presents with a high-energy injury of the ankle region, and often other serious injuries. In such serious injuries, there is a risk of nerve and vascular injury and compartment syndrome, although these seem to be uncommon on the basis of the silence of published series. Plain radiography will usually give the diagnosis, although in the presence of severe comminution or deformity they may be difficult to interpret. A CT will give a good assessment of fracture severity and anatomy, contributing to the decision on whether to offer surgery, and surgical planning. Displacement of the ankle or subtalar surfaces, open injury, or overall malalignment, would generally be considered indications for ORIF. Undisplaced fractures seem to be uncommon. A few fractures are so severely comminuted that there seems little point in trying to reconstruct them acutely. Access may be possible through anterolateral and/or anteromedial approaches. 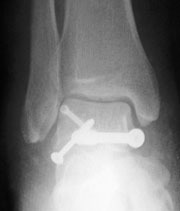 However, more posterior fracture lines or comminution may require medial or lateral malleolar osteotomy. Indeed, some of these injuries have associated malleolar fractures which are not necessarily convenient for access to the talus. Fixation is normally with lag screws which may have to be countersunk to prevent impingement. Headless screw designs are available but may not give enough compression. Talar body fractures are severe injuries which usually result in some functional reduction. Vallier found that about 2/3 of patients returned to their previous work. The main outcome predictor is the severity of the original injury as expressed by comminution and the presence of an open wound. 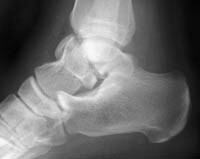 Most patients develop some osteoarthritis of the ankle and/or subtalar joint. 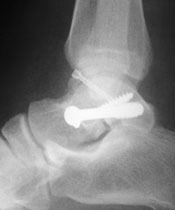 38% of Vallier’s patients developed osteonecrosis and half of these had talar collapse. However, it is not clear how many of these patients needed further surgery. Vallier’s series included two amputations for severe initial injuries and five subtalar, ankle or triple fusions.